I’ve just returned from week-long leadership development program in Israel called “Reality Storytellers” hosted by the Schusterman Foundation. I was honored to travel around the country with 40 of the brightest and inspiring creative leaders, from screenwriters to speechwriters, publicists to producers, authors to filmmakers and more. The trip was packed with opportunities for us to reflect on our leadership and values, pursue our passion for crafting powerful stories and identify ways that we want to “repair the world” by giving back. We were connected with some of Israel’s most influential creatives and visited and explored some of the world’s most sacred sites and heard the stories from our guide, himself, a virtuoso storyteller. We stayed in amazing places and enjoyed incredible meals by some of the top Chefs in Israel. We learned about the country’s history, political complexity, religions, people, and ancient and contemporary life. What social disparities do you most want to remedy? Where do these disparities come from? What core values drive leaders to fight for social change? How do our unique brands of leadership, our values and our perceptions of injustice contribute to our visions for a better future? As a Master Trainer and Adjunct Professor, I’m primarily known for my work in networks and nonprofit, but I’ve always approached it with a leadership lens. More recently, with support from the Packard Foundation, I’ve been working on an Emerging Leadership Development project with Third Plateau Social Impact Strategies. We co-authored the “Emerging Leaders Playbook,” and I designed and facilitated a peer learning project. This year’s work will build on this past year. So, this trip was a gift in terms of getting new ideas for instructional design. When you are a trainer, you are a designer and facilitator of learning experiences. To get empathy for your participants or students, it is always good to be a participant in other programs. As a participant, you can also learn a lot by observing and reverse engineering the instructional design. While the trip was a rich and deep experience, I using this post to reflect on the instructional design of the exercises and small group facilitation techniques. The design included the following structure to allow for full group and small group dialogue, interaction, and exercises. Morning Circle: Every morning before we left for the day’s itinerary with our guide and program leaders, we gathered in a circle for morning reflection facilitated by one of the cohort facilitators or a member of the community. Every morning there was the Hebrew word of the day – the meaning was explained and then linked to the places we’d visit and the stories that illuminated those locations, and activities. We also engaged in gratitude exercises. These were a mix of solo and sharing with another person. This intent, I think, was to set the tone for the day and to help build bonds between participants. Cohort Groups: The 40 participants were broken down into four small groups, each with a cohort facilitator. We were asked to prepare for specific leadership exercises and discussions that we would have in our smaller groups. The smaller groups were also used to do and debrief different activities. For example, after our visit to the Yad Vsahem (the Holocaust Museum in Jerusalem) and hearing the story of a survivor Giselle Cycowicz, an emotionally intense experience, we had a discussion in our cohort to process it all and relate to our own leadership values. 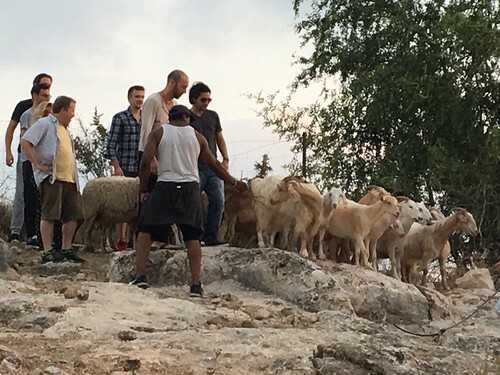 We got a bus from the airport and headed out to Neot Kedmim, a Biblical Landscape Reserve, a living museum to recreate the physical setting of the Bible. Our first exercise was to learn about the shepherds and then lead the sheep and goats into a feeding area. We divided into groups. The first group herded, while the second group was told to observe and learn from the first group’s efforts. We reflected on the applications to leadership. The big takeaway is that sheep don’t respond to yelling and you have to be confident. They responded better when you didn’t try to control or mico-manage their movement, but in a sense let go. As the parent of teenagers, there are good parenting applications here too! We traveled north to Michmoret Beach at Caesarea where we did a team building exercise and reflection on leadership styles. Each of the cohort groups of ten people each worked together to build a raft with a flag. The rafts were launched into the ocean in a race. The goal of exercise wasn’t to win the race, but rather to reflect on how we collaborated together and to better understand our leadership styles and those of other people around a specific goal. We divided into small groups based on what style was most natural to us and had a discussion on the beach. Exercise 3: What shapes our leadership style? Before you can understand your values, you have to understand defining moments in your life. We were asked to bring two objects with us on the trip. The first object should represent a turning point as a child and the second a turning point as an adult. We each shared our story with the group. Some people shared being vulnerable, others being inspired — so there were tears and laughter in our cohort groups. There is so much more share from the trip, so stay tuned for more.